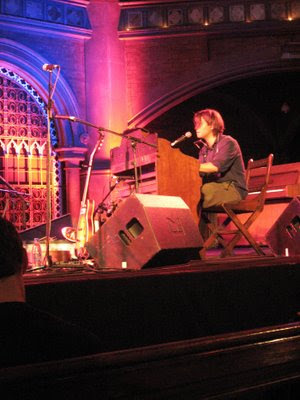 Last Tuesday (23rd) my derriere and I braved the unforgiving pews of the Union Chapel in Islington (N London) to hear The Low Anthem perform. I'd seen them play twice in the last month but was particularly excited about hearing how their songs (especially their gorgeous vocal harmonies) would be complemented by this gem of a venue. There are a couple of things you should know about this band. There are only three of them and even though it might sound like there are two lead vocalists when you hear the different styles on songs like 'Charlie Darwin' (Bon Iver-ish falsetto) and 'The Horizon is a Beltway' (raw Waits) from their recently released third album 'Oh My God Charlie Darwin', Ben Knox Miller is in fact the lead singer for all of their songs. Wow? Yes. One of the most versatile voices I've heard in a while. The other thing you should know is the name of the weird disc instrument Jocie Adams was playing -it's called a crotale, I had to look it up. The set list was mostly crammed full of songs from 'OMGCD' with the occasional song from 'What The Crow Brings', (their previous album), a new song which didn't have a name yet but I'd hazard a guess it'll be called something like 'The Blind Leads The Blind' and a few excellent covers including 'Sally Where Did You Get Your Liquor From' (Reverend Gary Davis), 'Don't Let Nobody Turn You 'Round' (Blind Willie McTell) which included a phenomenal introduction by Jeff Prystowsky on the double bass and 'Cigarettes, Whiskey & Wild, Wild Women' (Sons of the Pioneers). The Low Anthem dig deep into their American musical heritage to seek out suitable soulful gritty tunes to pump their own unique style and sound into resurrecting some of America's great and sometimes (at least in the UK) unheard or just simply forgotten songs from the past. Performing these covers alongside their own penned songs brings an edge that I think their live set needs and greatly benefits from. 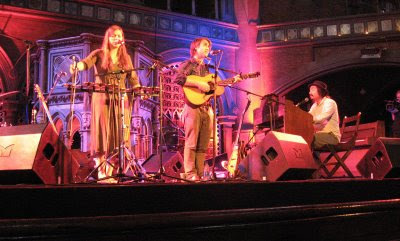 My highlights included the spine tingling harmonies of 'Charlie Darwin' which sounded simply divine in the Chapel surroundings. The look of surprise on the faces of a few people in the audience when they played the upbeat 'Home I'll Never Be' was quite entertaining, I'm not sure they were expecting the raucous vocals and fast pace from the same singer. I also enjoyed the smile on Jocie's face and the vigour with which she sang along to 'Cigarettes, Whiskey & Wild, Wild Women'. There was an annoying buzzing type noise coming from the organ amplifier that did almost ruin the gentle balance of sounds on some of the quieter songs, I was surprised the organisers didn't try to improve the situation a couple of songs in although maybe they couldn't hear it from where they were sitting. I was also a little disappointed I didn't get to see the slightly comical sight of Ben or Jeff Prystowsky's feet pumping away on the organ pedals from where I was sitting (see video below for an example)-for the record this is just about all I could find to complain about. The show ended to a well deserved rapturous applause, some people stood up to show their approval some couldn't move anymore because their legs had gone to sleep on the hard wood pews. A real treat to see an awesome band in such a befitting venue although next time I'm bringing a cushion along. It was a great evening and so pleased I went, are you booked up for their November show at the Tabernacle?..never been there before. I was so impressed I immediately snapped up tickets to see them in Oxford in October before swiftly realising that I'd double booked myself :-/ So, if you fancy a trip out of London and need your fix of them before November let me know and I can re-allocate them in your direction! Don't think I'll be able to make the Oxford concert but appreciate the offer, thanks. It's great when there are new bands that sound so good, the music world needs them.